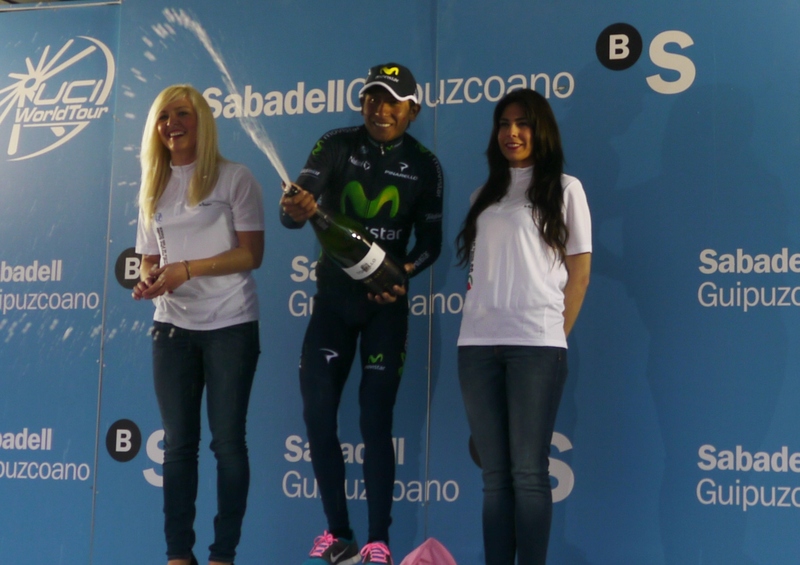 In a surprising turn of events Nairo Quintana took the overall, having won stage four atop Eibar-Arrate and finished runner-up in the concluding time trial. The 23-year-old wrested the leader’s and points jerseys from fellow Colombian Sergio Henao, with Tasmanian Richie Porte sandwiched in between. 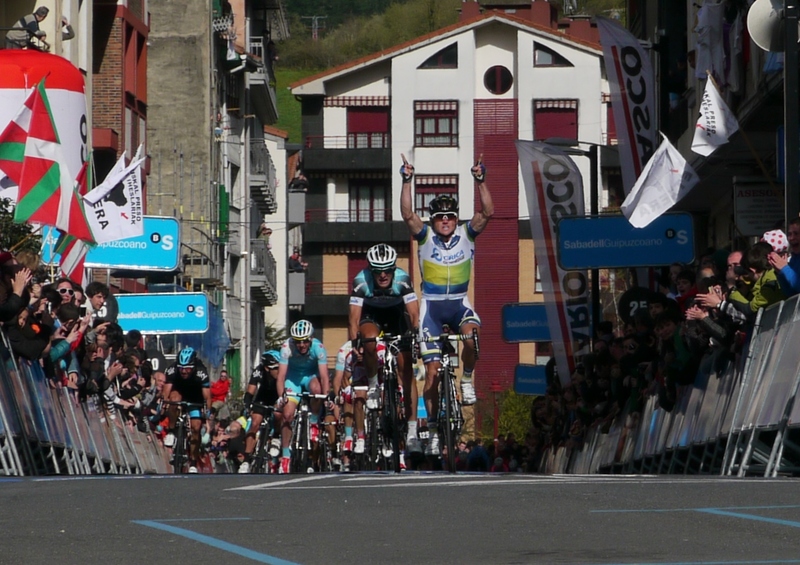 Local boy Amets Txurruka claimed the King of the Mountains and sprint jerseys while Movistar were the best team. Simon Gerrans (Orica-GreenEDGE) took his third victory of the season, winning the first stage’s reduced bunch sprint ahead of Peter Velits (Omega Pharma-Quick Step) and Angel Vicioso (Katusha) after the peloton had been split by a crash near the summit on the final ascent, just 7km from the finish. Some of the leading contenders fell, were delayed or distanced on the fast, technical descent where Alberto Contador’s (Saxo-Tinkoff) aggression further split the leading group with 17, including many of the favourites, going clear in the last 5km. The two-man break of the day, Amets Txurruka (Caja Rural) and Laurent Didier (RadioShack-Leopard), had both been pulled back into the bunch well before the last climb. There was a sense of deja vu on stage two as South Africa’s Daryl Impey (Orica-GreenEDGE) repeated his feat of last year, taking the bunch sprint ahead of Astana’s Francesco Gavazzi (who had the consolation of taking over the leader’s jersey), with Vicioso third again. Txurruka was once more out front for most of the day hoovering up the mountain and sprint points. Orica-GreenEDGE kept the gap to a manageable distance, before Lampre-Merida’s Adriano Malori and RadioShack’s evergreen Jens Voigt time-trialled away from the bunch with around 30km remaining, catching Txurruka on the penultimate descent. But all the escapees were back in the pack with 4km to go and it just remained for Orica – specifically race leader Gerrans – to lead Impey to the finishing line. Sergio Henao (Sky) was the strongest in the Colombian shoot-out on stage three’s 167.7km stage to the top of the 7.4km climb La Lajana – technical and wickedly steep in parts – which left many slumped over their handlebars, exhausted. In a scene straight from Groundhog Day, that man Txurruka was out in the break again. The Astana-led peloton wisely didn’t allow them too much leeway and everyone was safely back in the bunch well before the final trial of strength. Movistar moved to the head of the peloton to set up their Colombian, Nairo Quintana, who eventually finished fourth. Ultimately it was Henao and baby-faced Carlos Betancur (Ag2r La Mondiale) who went mano a mano all the way to the line, with the former shading it in a photo-finish. Katusha’s Giampaolo Caruso was third. Henao’s victory saw him take the leader’s and points jerseys while Txurruka’s three straight breakaway days saw him build an unassailable lead in the sprint and mountain competitions. The following day was the turn of 23-year-old Quintana to take victory, as he soloed away from the leading group in the final 100 metres or so on the downhill dip to the finish, gaining two seconds on Henao and third-placed Contador. To the delight of the public who had braved freezing fog and pouring rain, a final spurt from Samu Sanchez moved him up the GC. 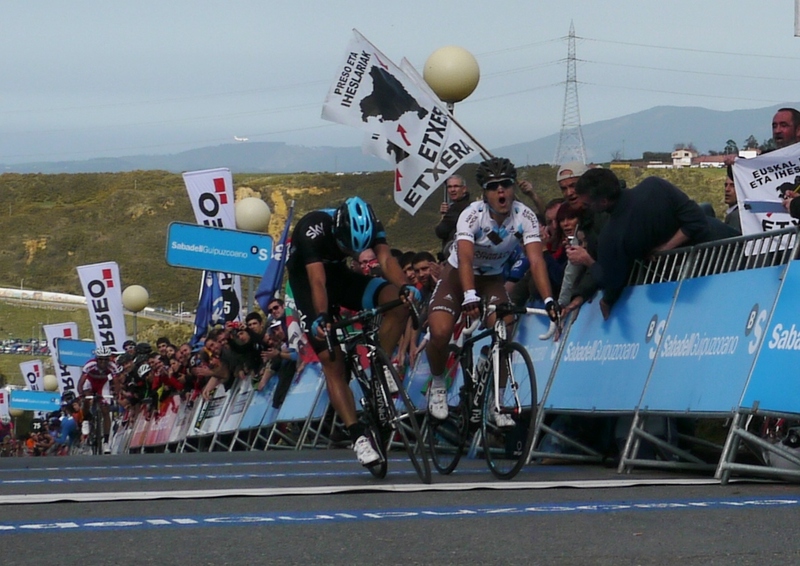 The day started with a dangerous trio including Andy Schleck (RadioShack) making an unsuccessful bid for freedom, with the main break established only after 46km of the 151,6km road to Eibar-Arrate. The Sky-led peloton never allowed the gap to grow much beyond five minutes, slowly reeling them in as they wound their way up and around Eibar. With under 40km to go, the break and the chasing pack fractured all over the first category Basque-lined Isua climb. Having regrouped on the descent, Sky slowly whittled down the gap and, at the foot of the ultimate climb, conceded responsibility for leadership to Movistar. In-form winner of the GP Miguel Indurain Simon Spilak (Katusha) led the charge only to be joined by the other contenders who matched one another up the climb until Quintana rode away. On the penultimate day’s ten-climb test Richie Porte (Sky) clearly hadn’t read the script, as he disappointed the large Basque crowd who’d braved pouring rain, hail and near freezing conditions, by jumping away in the dying kilometres to overhaul defending champion Sanchez, who finished second, four seconds back, along with third-placed race leader Henao and most of the other contenders. The 166.1km route from Eibar to Beasain was punctuated with attacks which saw groups of riders spread all over the parcours and riders climbing off their bikes each time the pack came through the finish town – only 73 finished the stage! However, Sky were always pulling the strings and anyone still in contention was in the leading bunch heading for the final ascent. Sanchez crested the summit first, pursued by the Sky boys and Spilak but sadly Samu failed to record his team’s first win of the season. None of the jerseys changed hands but only that of the leader still hung in the balance with Porte six seconds behind teammate Henao but four seconds ahead of Contador. In the final day’s challenging 24km time trial, world champion Tony Martin (Omega Pharma-Quick Step) set the winning time of 35:05 early on. 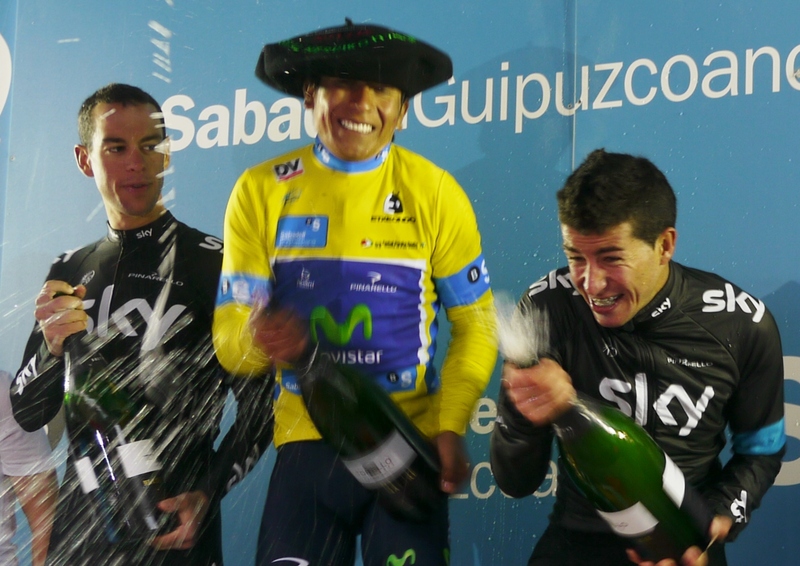 Overall favourite Porte was 40 seconds slower and, surprisingly, finished fourth behind Quintana – proving Colombians can time trial on hilly terrain – with Basque Benat Inxausti (Movistar) third. I’m super happy with this overall victory and time trial result, where I performed better than I expected. I’ve been feeling good these past few days and again today I had such a good feeling that I had to take advantage. It was a short time trial which favoured me and I managed my efforts well. It was quite slippery and I took risks on the descents. In fact, I almost fell on one occasion, but on the last descent I knew I’d done enough and could relax. Last year we proclaimed Colombians the must-have accessory in the mountains for those challenging in the Grand Tours. This year they’re the key piece in the season’s wardrobe. 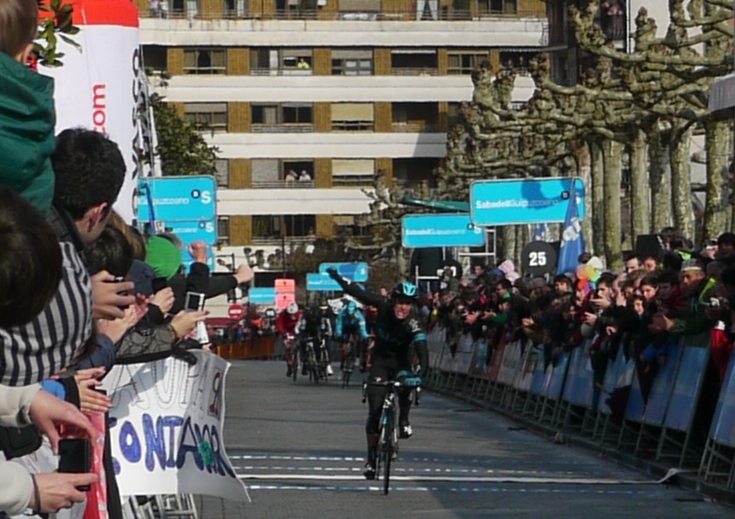 Messrs Betancur, Henao and overall winner Quintana, despite their youth and relative inexperience, have proved they can challenge the best over a difficult parcours, whatever the conditions, and deserve their plaudits. Of course, Sky, Movistar and Ag2r won’t be the only teams leaving with smiles on their faces. Orica-GreenEDGE bagged two stage wins, spent two days in the leader’s jersey and Pieter Weening finished sixth overall. I suspect that both Saxo-Tinkoff and Euskaltel-Euskadi will be satisfied with the overall progress of their respective leaders given their forthcoming Grand Tour challenges. Basque sensibilities were spared by Amets Txurruka who monopolised the mountains classification jersey and, ironically, the Euskaltel-sponsored orange sprint jersey earning plenty of press coverage and cheer for his new squad Caja Rural after being dropped at the end of last year by Euskaltel. 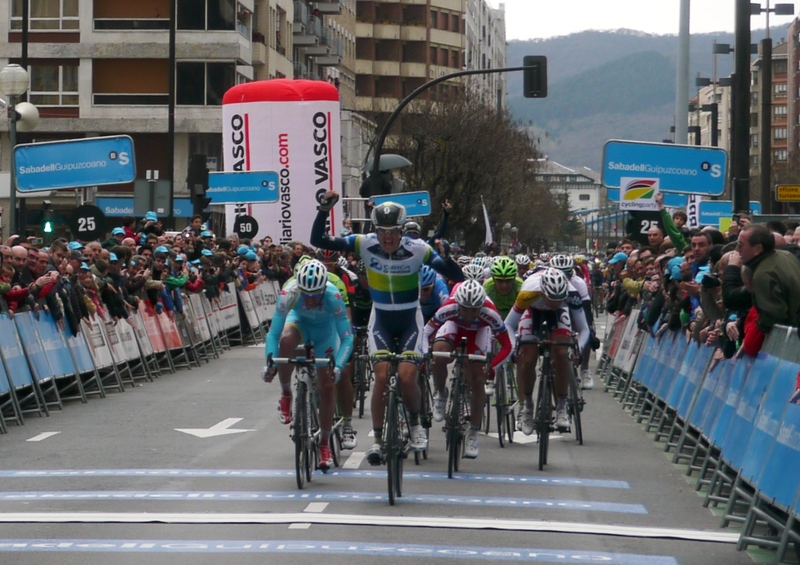 Best placed Basque overall was Movistar’s Benat Intxausti in eighth – another former Euskaltel rider. A number of teams such as BMC used the race to fine-tune form for the forthcoming Ardennes classics. Despite the high attrition rate, most teams finished with at least one rider, except Argos-Shimano who I suspect simply ran out of clean kit! 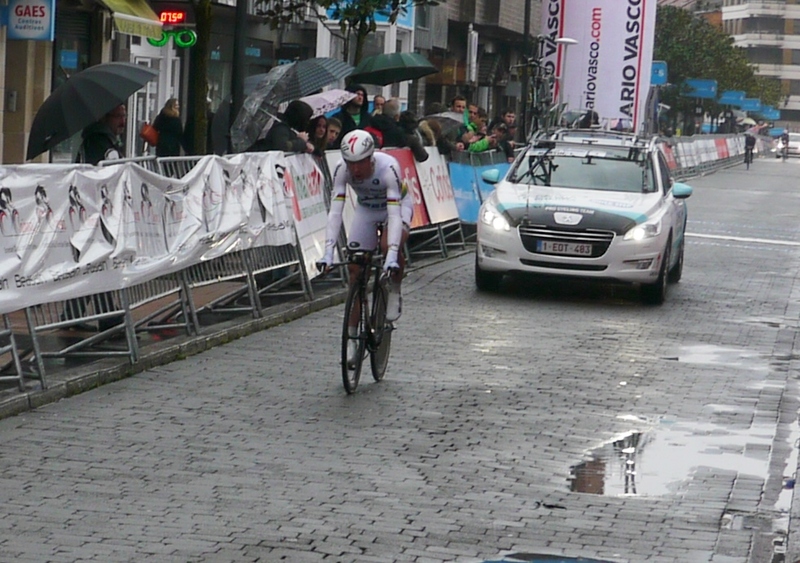 On a final note, it was good to see Wouter Poels (Vacansoleil-DCM) back in action after his serious fall last year. Can anyone enlighten me as to how the team classification is calculated at Vuelta al Pais Vasco and other stage races? Surprising to see Sky in 7th despite 2nd and 3rd place, is there an algorithm that combines time with number of finishers? Sheree will probably be able to confirm the detail better than I, but it’s typically done along the lines of taking the aggregate time of the top three finishers from each team on each stage. So Porte and Henao would have ‘scored’ well in that respect, but I’m guessing they would have been dragged down by the rest of their train dropping off and all finishing several minutes down. The method of calculation may be different for Pais Vasco, but I imagine this is the cause of Sky finishing so low in the team classification. Obviously it’s not a high priority for them.